Whether you’re an experienced paddler or a brand new kayaker, finding a way to carry your kayaks can be difficult, especially if your driving longer distances. 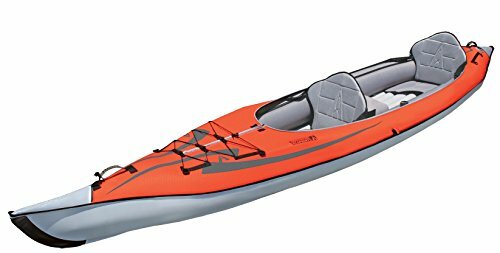 With just one kayak, it might fit on the roof or in the truck bed. Two kayaks might fit in a special roof rack. For multiple kayaks or vehicles that can’t fit boats on the roof, you may have to consider a kayak trailer. We’re going to help you understand what to look for to choose the best kayak trailer for your needs. By the end of the article you’ll know the good bad and ugly of choosing a kayak trailer. For more of my top gear recommendations, have a look through these popular Outside Pursuits guide links: Recreational Kayaks, Kayak Carts, Kayak Roof Racks. We’ll also give you a few suggestions so you can get started choosing a top rated kayak trailer a little quicker with our comparison table and buyers guide. Let’s get into it! Crossbar Width: 78" 64" 78"
If you want to start your research or order online, this list is comprised of some great choices for kayak trailers. We went with well loved kayak trailers you can count on! 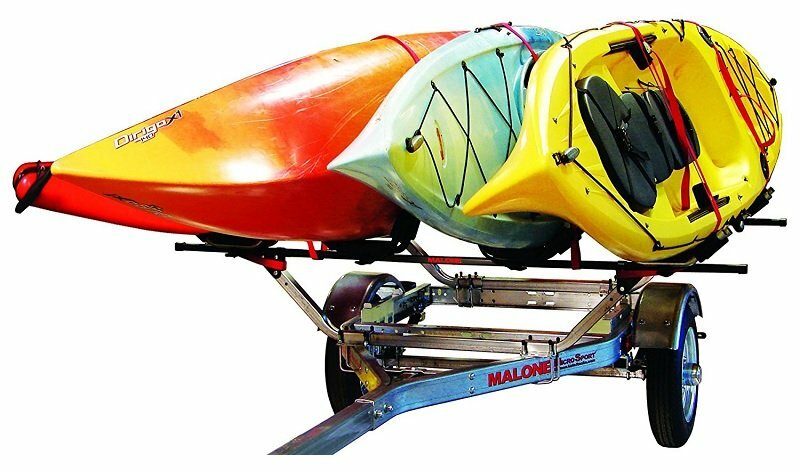 Malone makes tons of kayak and canoe accessories from trailer, roof racks, and mounts. That’s why this trailer is a great deal. Not only do you get a solid kayak trailer, you’re also saving tons of money because they bundle in 4 of their J-Pro2 Kayak carriers on the trailer. There’s enough room for up to 4 kayaks on this trailer. I love that they mount sideways using the J-Pro2 carriers which are reliable and easy to use. On our entire list this is the only 4 kayak capacity trailer we’ll review. If you need space for more than two kayaks on trailer, this is your last stop! 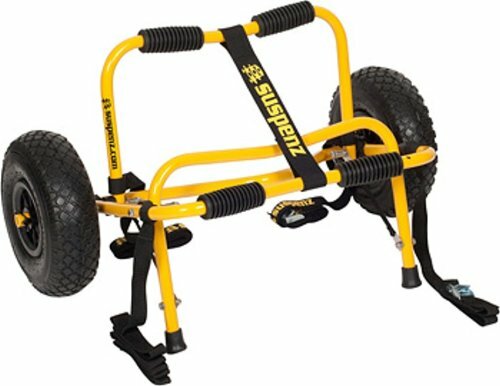 Spare tire, safety chains, kayak carriers, and straps are all included. That makes this aluminum frame trailer easy to use and simple to operate. The hardest part will be assembly after arrival but we’re sure you can handle that. I like the sturdy box channel frame that’s a little more robust than some kayak trailers in this class. In my opinion the Malone Mocrosport is the best kayak trailer. Best For: Paddlers who need space for an entire family worth of kayaks on one trailer! This universal trailer is a little more open to the imagination. Essentially what you get out of the box is a lightweight aluminum trailer that can be used for just about anything with two horizontal aluminum cross bars. There are no kayak carriers or mounting cradles included with the trailer. For some this seems odd. Others will understand the value of versatility. With a few ratchet straps and a little ingenuity you’ll be able to mount everything from kayaks to SUPs, canoes, bikes, and anything else you can think of. I like that the trailer leaves room for users to modify it to fit just about any adventure objects. In fact you could probably even adapt it to carry extra gear for a weekend camping trip. It’s just a matter of your imagination. I wouldn’t try to fit more than two kayaks on this trailer as you’ll have trouble finding the space or securing the load. 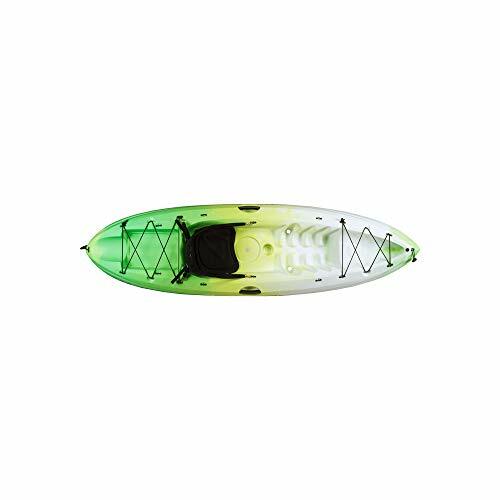 Best For: Paddlers who want to be able to use their kayak trailer for bikes, SUPs or other equipment with some quick adjustments! Another great trailer from Malone that, unlike the Ruff-Sport, has dedicated kayak racks built in. You won’t be able to carry other gear on it, but if you’re looking for a dedicated dual kayak trailer it probably doesn’t get much better. 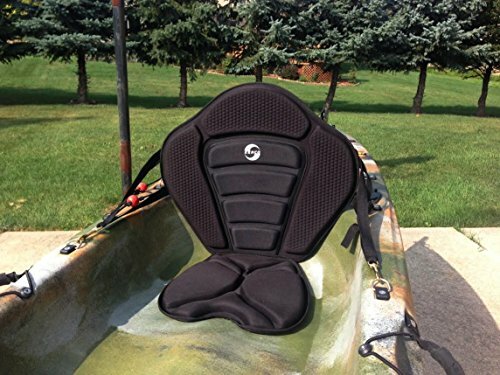 Two vertical deep V-shaped kayak holders come with ratchet straps built in. All you have to do is tuck the kayak into it’s cradle and then strap it down nice and secure. There are few trailers with this kind of built in security for holding a kayak load. I like that it’s built to do one thing very well. The sturdy box channel frame should be more than enough to hold up to anything you’ll need to carry the kayaks through. Just be careful on particular rough roads as it’s a lightweight trailer and could bounce or jostle if you’re not conscious of how you’re driving with it. The kayak cradles are adjustable side to side so that you can make room and adjustments for any loads you’ll need to carry. You can even adjust each arm independently so you might be able to get away with carrying loads such as the occasional canoe. 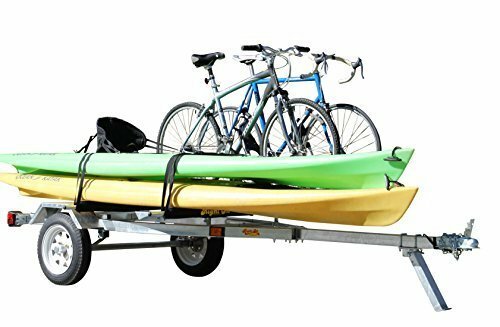 Best For: Dedicated trailer space that’s the perfect two kayak trailer with lots of reliability and load security. Similar to the Ruff-Sport, this bare bones trailer leaves much up to the whims of the user. You’ll be able to tailor this kayak trailer exactly the way you want it with just a few touches. Even though it only has two horizontal bars, you can still attach dedicated kayak carriers to it if you want. Or just leave it open and simply strap down your kayak with a few webbing buckles. That way you can swap it out when needed. With dramatically different price tags between the MicroSport and the Ruff-Sport, it’s hard to make a good call. Both trailers are made from lightweight aluminum. Both have running lights. Both have horizontal rails. So which one is better? It’s hard to say really. 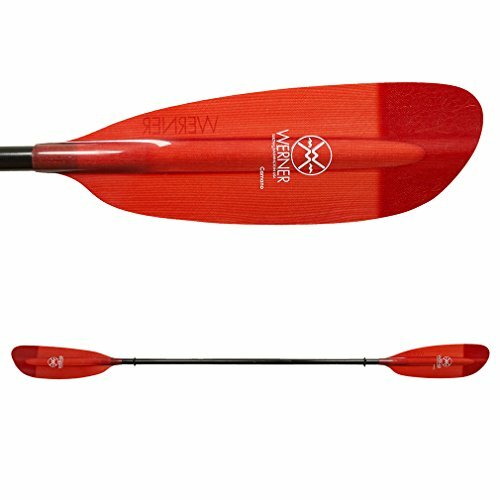 I would suggest that you choose the one that fits your kayaks best by dimensions and be sure to leave room for future growth in case you trade your kayaks for longer or bigger ones. This trailer is best for those who might prefer the more reputable Malone name and construction. Last but not least on our list is the Yakima trailer. Most will recognize Yakima as a leader in kayak carrier and trailer accessories for aftermarket. 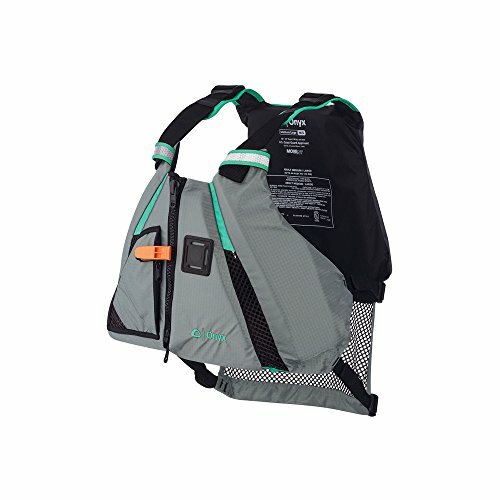 Yakima is a dominant name in kayak carrying gear. I love that their trailer is an impressive 78” wide. That’s quite a bit more space than the MicroSport or Ruff-Sport. Plus, it’s designed specifically to be compatible with all Yakima carriers. 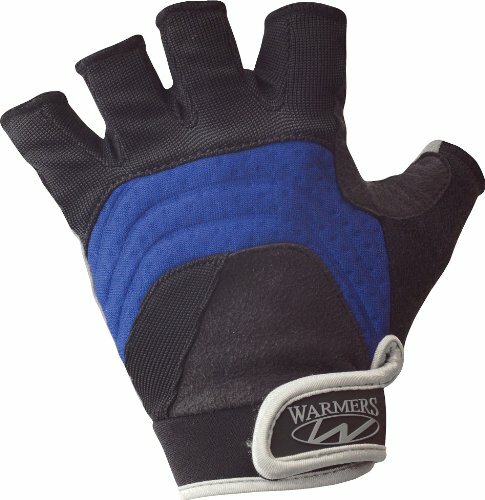 That means you can easily put on the carrier of your choice from J carriers to horizontal bars. The tongue and wheels are lockabale so that nobody can lift your nice trailer while you’re out paddling the lake. This is a nice feature, but other trailers can be locked with a simple padlock and who really steals trailer wheels? It’s a negligibly useful addition to the trailer overall, I think. Two major drawbacks are that you’ll have to buy additional kayak carriers from Yakima to get the most out of this already expensive trailer. That makes for a multi-thousand dollar expense before you’re ready to rock and roll with the trailer. I also don’t like the thin wheels that seem prone to getting stuck or damaged by large potholes or ruts in muddy forest roads. Best For: Yakima fans that want something compatible with Yakima accessories. Kayak trailers are popular for large groups and institutional settings like scout camps, summer camps, and expeditions. 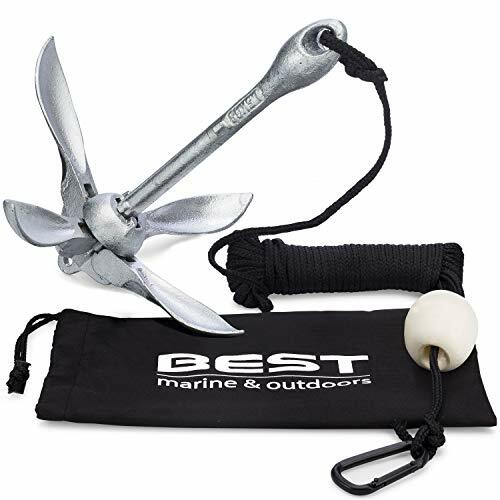 They help get multiple people, boats, and gear to the put in location with ease. Picking out a kayak trailer can seem like a nightmare, especially if you’re not familiar with trailers. Let’s find out what really matters when choosing a trailer. If you’re planning on running a Girl Scout camp you might need to carry a few dozen kayaks. Most of us don’t need this many kayaks on a single trailer. However, they do make them with capacities of 16+ single kayaks on a single trailer. You may want to contact a local trailer maker if you have special needs like this. For the rest of us, our kayak needs tend to be somewhere between 1-4 kayaks for a family or small group. Many kayak trailers are large enough for two kayaks and four is common enough. When your needs exceed this ballpark you may want to consider a custom trailer. 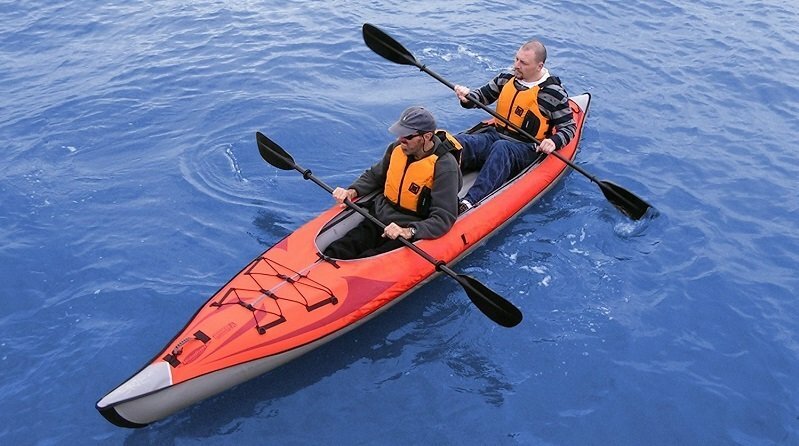 Almost all kayak trailers are made to handle single or tandem kayaks. That’s not to say that you shouldn’t double check though. The length of the trailer tongue may determine how easy it is to fit larger kayaks. If you’ve got a particularly tiny trailer it might be difficult or impossible to fit longer tandem or sea kayaks. Before ordering your kayak trailer, contact the manufacturer if you have any doubt that your kayaks will fit. Returning an entire trailer can be a real hassle, particularly if you order online. If you want to know the dimensions of the trailer you’re ordering, check the manufacturer’s website. If this doesn’t clarify then you can often find the answer in Amazon customer reviews. Chances are good that someone else has already asked about what size boats can fit in your particular trailer. It may required some reading and measuring but you’ll figure it out! If all else fails, ask some questions yourself. Buying a kayak trailer online will result in a huge pile of heavy boxes being unloaded at your door. Then you get the distinct pleasure of tugging them around, unboxing a bunch of steel parts, and trying to put it together. There are actually two things to consider here. First, are you mechanical enough to put it together properly? 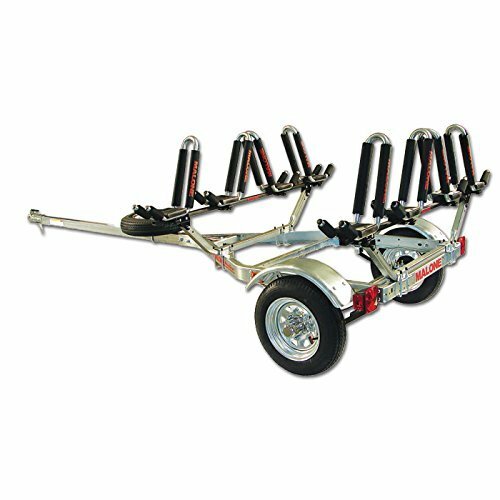 If not you may get frustrated or fail to assemble the trailer properly. This can be just down right dangerous if the trailer flies apart on the highway because you forgot a bolt. Secondly, you’ll need some tools. Some of the tools for trailer assembly can be uncommon sizes or shapes. You may end up spending quite a bit on special tools just for this job. Again, frustrating and annoying. If you’re not mechanically inclined and don’t have a good set of tools you may want to simply buy the trailer pre-assembled. Even if it’s a hundred dollars more expensive, it might be worth it in the end. Most kayak trailers use similar size tires. However, where differences exist, larger and wider tires are better for rougher terrain. Smaller tires are fine for the lightweight loads of carrying kayaks but they may suffer in off road or unkempt dirt road areas. If you’re heading into rough terrain, consider going with larger and wider trailer tires when available. There are lots of choices for your next kayak trailer. If you need room for up to four kayaks then your choice is clear, stick with the Malone Auto Racks MicroSport. For those who prefer versatility, the Ruff-Sport trailer with horizontal bars is probably best. Yakima fans know which trailer they’ll want! And for those who want a kayak trailer that’s ready to go with minimal hassle, consider the Malone Xtralight. One question frequently asked: Malone vs Yakima kayak trailers, which is better. Yakima products tend to be more expensive but you do get what you pay for: quality! 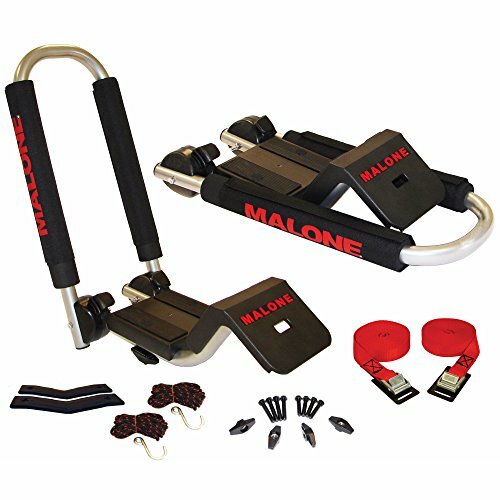 Malone trailers are a good choice as well. They tend to be easy to put together and versatile. Either would be a good choice for transporting your kayak! I hope this guide was helpful for finding the best kayak trailer to fit your needs. If you want to comment or recommend a trailer I didn’t include, please use my contact form to get in touch. Have fun and enjoy your time on the water!